Tuesday. In the past four days I have discovered something about what it is like to be a part of a community in sudden crisis, to have your campus put squarely and nearly instantaneously on the map of vast public consciousness, and to have that crisis turned into 24/7 news, a wickedly funny recursive internet meme and a symbol of vast outrage right before your eyes. It means that you look to other people in that community for comfort, and talking, and an uncertain but very real need to come together. 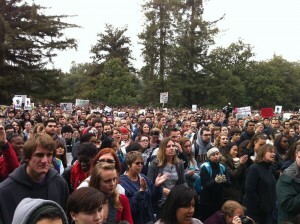 General Assembly, 11/21/11, UC Davis Quad. Credit Jonathan Eisen, cc-by. And it means that you find yourself in the unenviable state of having your campus be the centerpiece of the facebook updates and twitterstreams of friends and the discussion topic of strangers’ cocktail parties, and of hard discussions in every department and email list and water-coolered hallway, for an event that you wouldn’t wish on anyone. Working for a university is a different kind of thing than attending one. I do not feel the same kind of alma mater loyalty that makes people nostalgic, or wear collegiate sweatshirts. Instead I realize — perhaps slightly queasily at times — that I do support this school, and have certainly affiliated myself with its success and prosperity, because I have put my labor and my best efforts (and perhaps my best years) into making it so. I have always believed that it matters where you work; that, given the privilege of choice (and it is a privilege, a deep one, to be able to choose) one’s labor shouldn’t go to something you don’t truly believe in. The nature of protest is that you care enough to act — that you believe that some part of the system you take part in can be made better. There have been dozens of commentaries the last couple of days on police brutality in America and on college campuses; there have been eloquent essays about the nature of protest. Many pieces of advice have been given to our suddenly-embattled chancellor; many eloquent letters from our faculty have been published online, some calling for resignation but many calling for support and strength. A piece that has stayed with me is one by Cathy Davidson, pointing out that really student protestors are on the side of everything university leaders should be on the side of; that these students are the best allies for going to a state legislator and an unwilling populace to ask for support. The students, in other words, care enough about the system they are in to act. At UCD last night, some enterprising students built a 30-foot steel-framed geodesic dome to stand where the razed tents had stood (and where they reappeared last night). Whose education does this help? All of ours, we can hope. 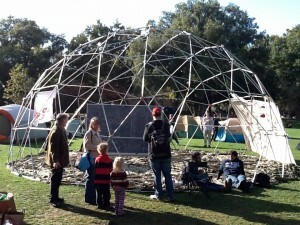 Geodesic Dome, UC Davis quad. Credit Jonathan Eisen, cc-by. 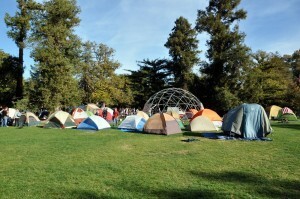 tents on the UC Davis quad. Credit Jonathan Eisen, cc-by. ETA: Katehi’s speech last night. This entry was posted in life, sightings in davis. Bookmark the permalink. Phoebe, your best years are not behind you. 🙂 I deeply appreciate the challenge you have in trying to be supportive of the Best and Brightest against the Worst and Dimmest. I was, frankly, horrified to see the comi-tragic meme heard ’round the world. It’s funny, alright, but I’m 3000 miles away and didn’t get chemical agent sprayed down my throat. I’m sure Lt. Pike didn’t have a thought that his actions would launch the strongest wave of student reaction since Kent State and the Free Speech Movement, but that’s where we are. Be strong. You are doing a Very Good Thing. The whole world’s watching, and that’s okay. Phoebe, you continue to amaze me. I’ve got your back as much as I can.